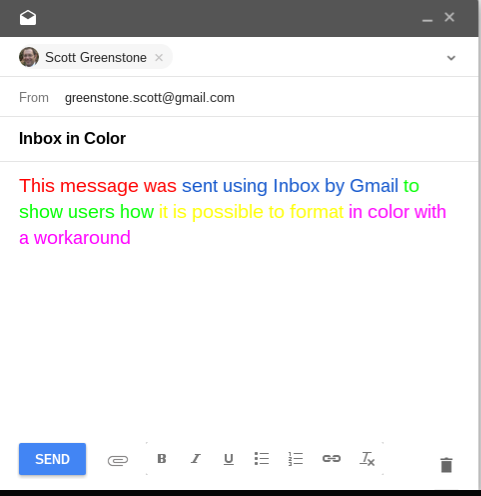 Formatting text into various colors is a rather simple task built right into classic Gmail. Inbox by Gmail, however, doesn't have this capability built in at this time. Many times I find myself responding to people on the Gmail Product Forums asking for this very feature in Inbox by Gmail. I decide to see if I could come up with a workaround if/until this feature is implemented into Inbox by Gmail. I am happy to say, I found a workaround. Please beware, however, this workaround is rather clunky, a bit time consuming, and not very user friendly. But for those that really want to do this in Inbox by Gmail, here it goes. See, I told you it was rather clunky and a bit time consuming. But it does work. The image above is composing, image below is how it looks upon receipt (identical as the compose). Maybe in the not to distant future the Inbox team will add this functionality to the text formatting bar. Thanks for the post. Doesn't seem like the Google team put a lot of thought into delivering a finished, user friendly product. I like the idea of Inbox, and am trying to use it on all platforms, but to deliver a product with such glaring omissions as rich text formatting and retention of any formatting when copying and pasting, seems ridiculous to me, Why deliver a product that doesn't include features we've been using for years??? I don't get it. I keep trying to like Google Inbox, but it is woefully inadequate for real work (I use my Google Apps for Work Gmail account for work). Simple, basic things like "Filter messages like these" require god knows how many extra steps to achieve, and I keep having to switch back to Gmail classic to get anything meaningful done. Why not just move an email to a bundle and they when you get the message to always do this, click on that? One additional tip: you just need to copy and paste the colored text from an external text editor once. 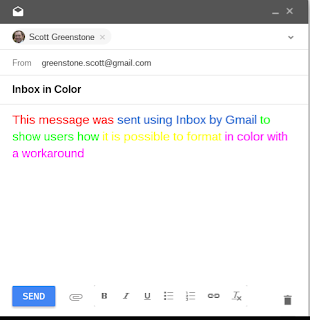 If you have already inserted colored text within your inbox new message window, then all the text that you may insert (typing or copying and pasting) in the middle of an already colored word/sentence will be automatically formated with the same color. In answer to other people comments: What I really like from inbox is the possibility to snooze email at any date/time and to save links in my inbox. However the message grouping is sometimes confusing (sometimes I missed some new incoming mails or I replied to the wrong destine) and the fact that the new message window cannot be resized is a burden. Wow thanks so much - I did not know about that.